People with Cancer birthdays will find their rising signs here. Refer to the date you were born. 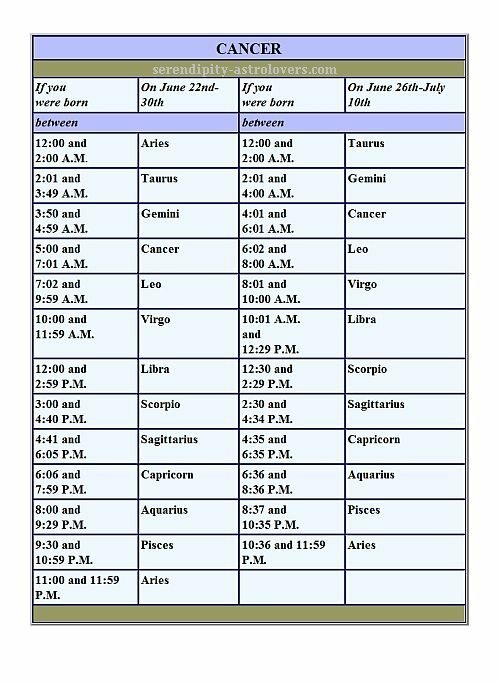 To the right of that column, refer to the nearest hour/minute to the time you were born that is before your birth time, not after it. The astrology sign listed in the box next to it is your rising sign. Some of you may not have a time of birth for whatever reason. A rectification chart could maybe fix that. An Astrologer follows the major events of life, and in doing this, pinpointing the rising sign. You may find that these ascendants differ from what your chart says there may be reasons for that. You may find that the approximated ascendants noted on these tables disagree with what you thought; there might be some grounds for that. You know from our pages that each zodiac sign takes up 30 degrees on the zodiac ring. Another thing you should know is that the Earth's angle causes the signs to ascend in different (slow or fast) times. If you were born in the Southern hemisphere your sign is probably one that took a (fast= short ascension). If you were born in the Northern hemisphere your sign will assumed a (slow= long ascension). 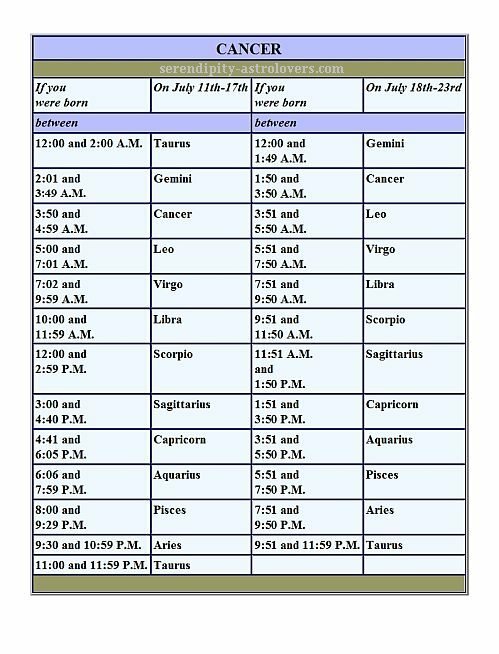 This table is for any year, this is because ascendant calculation does not use the year. It is best to have a correct birth time. A birth time that you guess is better than no time at all.